The KJ came with stock Al wheels with fairly decent Yokohama 235-70-16's on them. They seem to work well, with just a touch of rubbing at full lock on the steering wheel (something I expect will go away once I do a small lift). Where I live, studded snows are pretty much necessary for the winter (which is now upon us, getting 4-8" of snow tonight as I write this). I found a like new set of studded 235-65-17 tires. These should fit the same, tire calculators say they are 2mm bigger in diameter than the 16's that are on there now. But I have to get some 17" wheels for them. Not that big a deal as I usually get two sets of wheels for my vehicles, so I can do the summer/snow swaps myself rather than going into the tire shops. So I have been looking around (mostly on craigslist) for sets of used Jeep 17" wheels, but I am a bit unsure of which ones I can use. I see on the bolt pattern charts that in addition to Liberty wheels, quite a few other jeep wheels have the same bolt pattern (Wrangler, Grand Cherokee, Cherokee, Commander, Compass) but some have a different offset. Would those work? How about Renegade wheels (is a Renegade a KJ, sorry but I am showing my lack of Jeep knowledge)? I'm not looking for anything fancy, after all these are for snow tires and will be covered in mud most of the time. Suggestions for which 17" wheels would fit those new tires and Liberty? 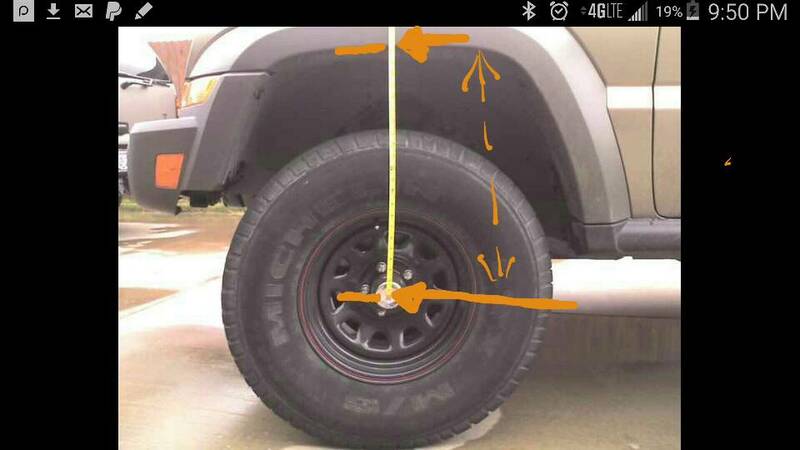 I've read about a lift/sagging measurement people do; I think it is center of axle to rim of fender but not 100% sure. Can someone tell me the "right" way to do this measure, and what common values should be for stock, sagged, lifted, etc. Measure from the bead on your rim to the bottom of your guard...that measurement never changed and you can rest the end of the tape in the bead then measure up to your guard/fender. Got another wheel question for this KJ. 17" wheels for it are pretty scarce, but I've noticed there are plenty of 5x5 bolt pattern 17" jeep wheels out there. So I was wondering if I got a set of Jeep 5x5 17" wheels (like from a newer Wrangler or GC), and got 1.5" 5x4.5 to 5x5 converters to make them fit, would that work? Looks like most of the converters are 1.25 to 1.5" thick. It seems to me that this combo should be OK. However the wheels will stick out a bit further than before, and might contact the rim of the wheel well on large excursions upwards (probably would touch now too, but would be make more contact with the tires spaced out more). BTW, I measure 18.5" from center of axle to edge of wheel well rim. Is that sagged, lifted (what's the stock measure)? What do folks think, OK or not? I just recently installed OME lift kit and a clevis spacers for my -06 CRD and now I have my "new" 17" OEM wheels in the paint shop, expecting them to be ready by the end of the week. My friend had 265/65/17 GoodYear Wrangler UltraGrip SUV all season tires which he was getting rid of because hes driving regurlarly to Lapland (I live in Finland ) with his truck and you pretty much need studded tires there. Soo, I pretty much blindly bought em from him since they came with the truck and he hasnt even used them, so they are pretty much brand new. Now when my lift is installed and I am getting closer to actually getting my rims I started to wonder - will they fit? Gladly the GoodYears are not an AT tire so the pattern is not aggressive or anything. I guess Ill just pound the pinch welds and hope for the best then. Is this an backspacing issue or just that the tire is so wide? Will be getting something with proper offset for my summer tires but Im quite happy if I could just manage with those tires as they didnt cost me a dime and are supposedly fine. I guess Ill just pound the pinch welds and hope for the best then. Is this an backspacing issue or just that the tire is so goddamn wide? poopy as hell right now, still some crap from last weekends wheelin and craploads of mud and stuff around here this time of the year.